Whiz the first five pesto ingredients in a food processor. With the motor still running, add the oil. Season. Transfer to an airtight container and chill until needed. Preheat the oven to 180°C/gas mark 4. Put the vine tomatoes on a roasting tray and roast for 15 minutes or until the skins start to split. Meanwhile, cook the penne according to the packet instructions. 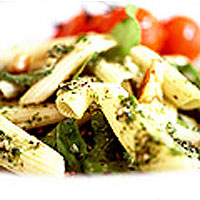 Drain, and toss the pesto and rocket leaves through. Garnish with walnuts and serve with the tomatoes, sprinkled with sea salt.